Reporter Tim Ralfe questions Prime Minister Pierre Trudeau on the invocation of the War Measures Act and elicits Trudeau’s famous “Just watch me” quote, Oct. 13, 1970. Robert Cote is 74 now, retired and living in east end Montreal, the city where he was born, raised and worked most of his life. 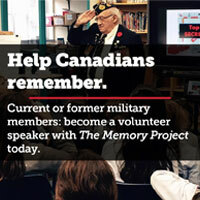 He is a former city councillor, Montreal police officer and Canadian soldier who served on peacekeeping missions in Europe in the 1950s, at the height of the Cold War. In the course of a long conversation about his varied and colourful career, Cote rhymes off certain dates with an ease and familiarity that suggests he is talking about the birthdays of his children or perhaps nieces and nephews: May 7, 1963; May 5, 1966; Nov. 18, 1969; July 12, 1970. But the dates have nothing to do with such pleasant events. On those occasions, the Front de Libération du Québec (FLQ) planted homemade bombs in various parts of Montreal. Every time the FLQ struck, Cote more than earned his pay. 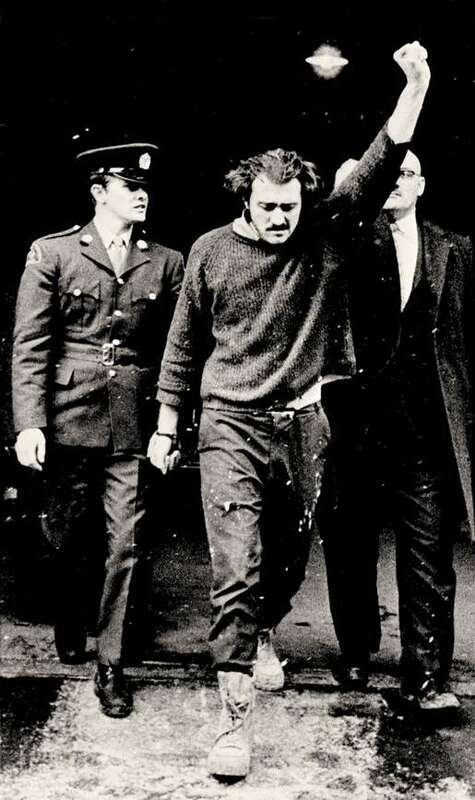 He was head of the police department’s bomb squad during the height of the FLQ crime spree, which lasted from 1963 until the end of 1970 and involved more than 200 violent incidents, including robberies, hold-ups, bombings and six deaths. Earlier that day, as Cote drove to Windsor Station and thousands of other Montrealers made their way to work, a car was stolen from the LaSalle Taxi Co. A number of men later piled into the car and drove through rush hour traffic toward the exclusive Anglo enclave of Westmount. They ascended a steep, narrow, north-south street toward the summit of Mount Royal. The driver turned onto Pine Avenue, the last east-west thoroughfare on the side of the mountain—and then onto Redpath Crescent and stopped in front of number 1297—a two-storey, stone house where James Cross lived with his wife Barbara. Police and protesters clash in Montreal, March 1969. Cross was upstairs getting dressed when the doorbell rang. The maid answered, toting a baby in one arm. “Birthday present for Mr. Cross,” said a man standing on the step. A companion next to him held a long, narrow brightly wrapped package. The maid said she didn’t have a pen to sign for the gift. “Here’s one,” replied the first man and pulled a revolver from his pocket. The other tore away the gift wrap from the package—revealing a submachine-gun. “It’s the FLQ,” he announced and the two of them dashed upstairs. At a home across the street, handyman Domenico Lasource was raking leaves. He had seen the cab drive up and stop. He paused for a moment and leaned on his rake and watched as the two men emerged with Cross between them. They pushed him into the car, then jumped in themselves. The driver pulled a U-turn and sped off toward downtown. That was the last anyone—other than his abductors—saw of the British trade commissioner for the next 60 days. That Saturday morning—Oct. 10—was the start of the Thanksgiving weekend and by the end of the day the FLQ had stuck again. Around 6:30 p.m., Quebec’s minister of labour and immigration, Pierre Laporte, was tossing a football with a nephew on the street in front of his home in St. Lambert, another south shore suburb. A beat-up green Chevrolet with four men inside approached. The car stopped. The men—Bernard Lortie, Francis Simard, Paul Rose and his brother Jacques—got out. They forced Laporte into the vehicle at gunpoint and then sped off. Both groups of kidnappers were members of the radical fringe of the separatist movement that had emerged in Quebec. They intended to use their hostages as pawns to bargain for the release of so-called political prisoners—23 FLQ members serving time in federal penitentiaries for robbery, murder, bombings and other violent crimes. They also believed, naively as it turned out, that their actions might unleash a popular uprising against the Anglo-capitalist forces that had so long dominated the Quebec economy and, in their view, enslaved the French Canadian people. 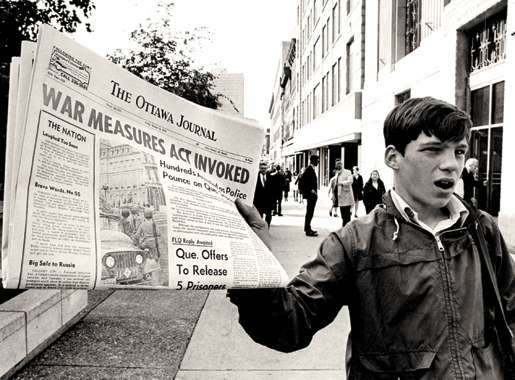 A newsboy hits the streets in Ottawa, Oct. 16, 1970. But events quickly turned in directions they had not anticipated. The second kidnapping, by members of the FLQ’s self-described Chenier cell, shocked most Quebeckers and the vast majority of Canadians. Prime Minister Pierre Trudeau and Quebec Premier Robert Bourassa moved quickly over the next week to take control and, in the process, they turned the October Crisis into one of the most controversial and hotly debated events in Canadian history. On Monday, Oct. 12, the federal government posted soldiers outside the Ottawa homes of other potential targets, including cabinet ministers, opposition leaders and senior diplomats. On the morning of Oct. 15, a Thursday, Bourassa and Montreal Mayor Jean Drapeau asked for troops to patrol the streets of Montreal. That evening, 3,000 students packed Paul Sauvé Arena for a pro-FLQ rally. 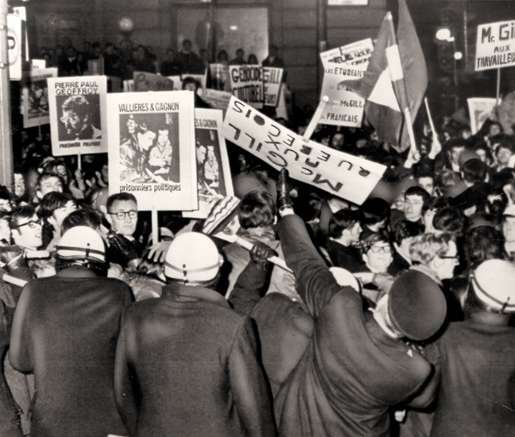 They listened to speeches by leading supporters of the organization and repeatedly chanted “FLQ, FLQ, FLQ.” The rally was just a warm-up for a major demonstration planned for the streets of downtown Montreal the following day. That protest never occurred. At 4 a.m., Oct. 16, the federal government invoked the War Measures Act on the grounds of an apprehended insurrection and by sunrise, Montreal police officers were conducting searches without warrants and arresting people without laying charges. Over the next 72 hours, 307 people were locked up. Within a few weeks, the number reached 497. Paul Rose leaves criminal court after being charged. The 49-year-old Laporte had been strangled with the gold chain he wore around his neck. Three weeks later, on Nov. 6, police arrested Lortie at an apartment in Montreal, but his three accomplices managed to escape by hiding behind a false wall they had constructed in a cupboard. By the end of November, police had located the Cross kidnappers at a duplex on Avenue des Recollets in Montreal North. They decided to negotiate rather than risk a confrontation with the heavily armed men inside the house. The kidnappers agreed to release Cross unharmed provided they were given safe passage to Cuba. On Dec. 3, the British diplomat was set free while his captors, Jacques Lanctôt, (along with his wife and child), Jacques Cossette-Trudel (along with his wife), Marc Carbonneau and Yves Langlois (alias Pierre Séguin) boarded a plane at Dorval International Airport and flew into exile. In late December, police captured Simard and the Rose brothers in a cold, damp tunnel they had dug beneath a rented farmhouse in St. Luc, Que., about 35 kilometres southeast of Montreal. Paul Rose and Simard were eventually sentenced to life imprisonment for the murder of Laporte. Lortie was convicted of kidnapping Laporte and Jacques Rose was convicted as an accessory. 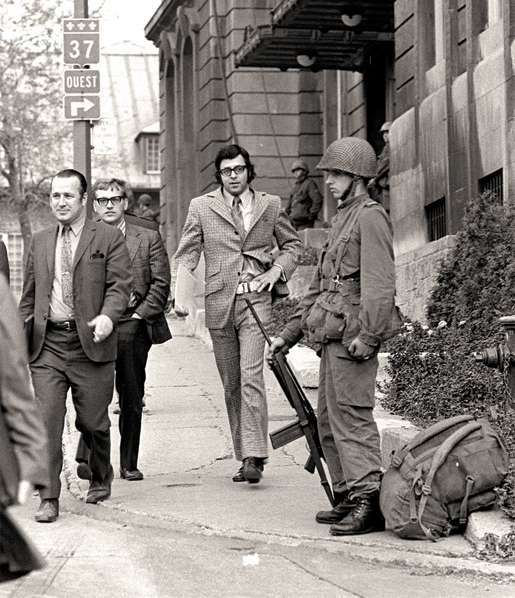 Civilians pass soldiers guarding Montreal’s city hall, Oct. 15, 1970. One of the few people to take a contrary view is William Tetley, now 83, who represented a Montreal constituency in Bourassa’s government and was a member of his cabinet during the crisis. Tetley, a retired professor of maritime law at McGill University, points out that political kidnappings were commonplace at the time of the October Crisis, especially in South America, and many governments exchanged prisoners for hostages—the result being that there were more kidnappings.